On the surface of the planet (which is flooded due to global warming), Raph wakes from a nightmare and is consoled by his wife (I think), Mezcaal (who looks alot like Raph’s former girlfriend, Ninjara). Menawhile, Donatello is working on the Time-Slip Generator that Armaggon had fouled up when he broke into Turtleco. While trying to make repairs, Don discovers that a human brain has been hooked up to the teleportation device. The techy turtle attempts to disconnect the brain and it projects a view of Nazi Germany on the Time-Slip Generator. The machine then causes a power surge and Donatello shuts it down, just as Leo calls on a giant projection screen. Leonardo explains to Don that he and his students were patrolling the city when they came upon some well armed bandits stealing gyroscope parts. Leo’s team easily defeated the thieves, but when the ninja master attempted to question them, they all took pills that caused them to vaporize. Leonardo explains that there must be something more complex going on than meets the eye, if the thieves were willing to die rather than talk. 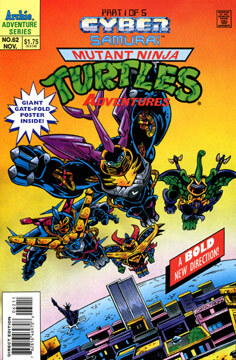 The Turtles’ leader tells his brother that the four should assemble and investigate. Mikey is drawing comics at Gabrielle’s Orphanage (owned and operated by Turtleco) when Donatello arrives in his Cyber Samurai exosuit. Back at Raph and Mez’s night club, Leonardo explains the situation to Raph and the two join their brothers to do some patrolling.